Click the image for an interactive presentation on Lizard Brain Solutions' capabilities. Meeting or team facilitation using large format visuals to guide participants towards consensus-driven decisions. We plan the engagement, prepare the materials, direct the meeting, and facilitate participants towards the outcomes, large-scale visual charts and placemat-sized visual templates help to gather ideas. We partner with you to design the agenda and deliver desired outcomes. Visuals that describes complex future states, current operating environments, or plans or proposals on a single placemat-sized sheet of paper. Data is gathered from existing source documents (ie – strategic plans), facilitated team meetings, and key stakeholder interviews. Content is organized using a technique called “visual triage” for sifting and binning similar themes. Themes are then linked into a single cohesive story or message. A visual is then designed around that story. Vision maps synthesizes or replaces lengthy documents and invites communication between the presenter and audience. Illustrating the conversations and information shared during a meeting. We do not interact with the team except for a few clarifying questions; we silently capture what they have to say. Success depends on a self-directed team or a traditional facilitator to manage the flow of the meeting. We should be informed of the agenda so we can prepare an icon library to draw from. Sketchnoting is small-scale graphic recording which is then shared with the group once complete. Although it does not have the same impact on the group experience or memory as full-scale graphic recording, it is effective when graphic recording is unfeasible. High-speed, time-lapsed illustration captured on video and voiced explanations and to communicate messages quickly and efficiently to wide audiences. Click here for an example of a Lizard Brain Solutions action sketch. 3-D graphic facilitation and graphic recording using state-of-the-art virtual reality technology. Limitless space for participants to fill with their ideas. Participants share in the virtual experience through large-scale projection. Virtual Visualization is an experimental capability! We are looking for opportunities to try this technology with clients willing to test and refine the methodology with us! Please let us know if you’d like to be a part developing of this capability! Click here for an example of Virtual Visualization! Draw others in at your next trade show, conference, or expo. 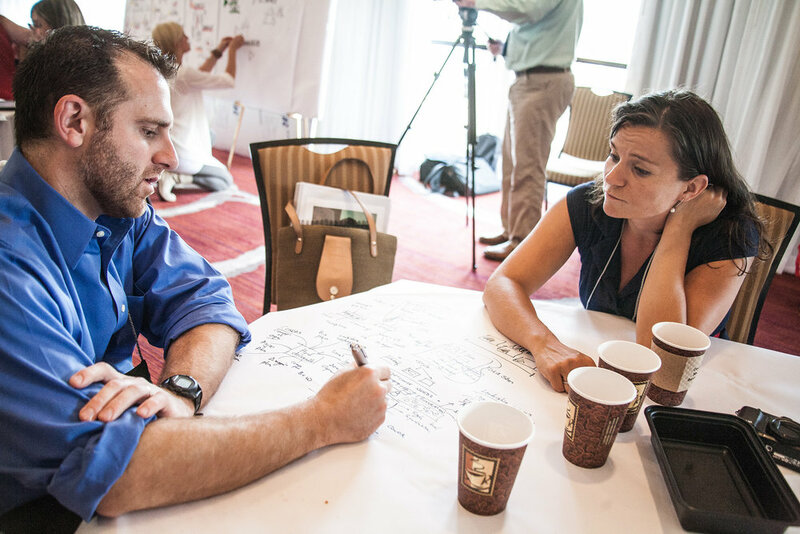 Graphic facilitation, graphic recording, sketchnoting, and virtual visualization encourage participants to share what's most important to them. 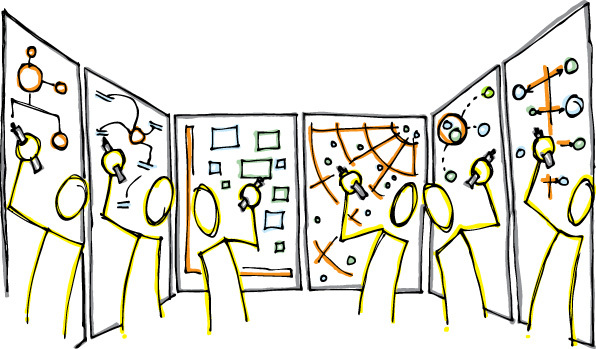 Our visual practitioners are trained and experienced in the art of consultative selling. Using non-aggressive, open-ended questions, they welcome participants into your space and provide entree for you share your own message. Create a Knowledge Wall of purposeful graffiti for others to leave their mark and share their ideas. Engage participants and harvest the knowledge of your industry. 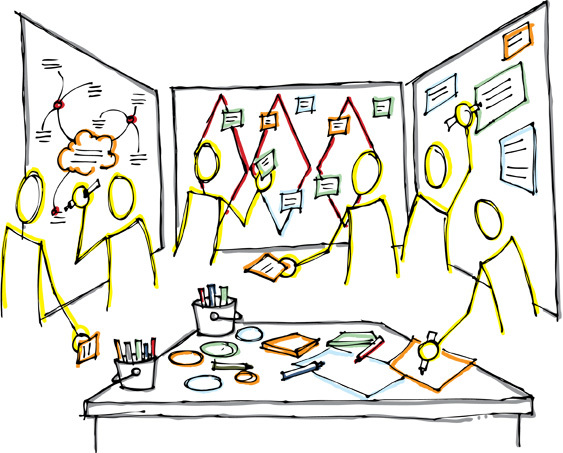 Visual methodology training: We train others in graphic facilitation, graphic recording, vision maps, mindmapping, and visual problem solving methods. Team and meeting facilitation: Traditional, non-visual team or meeting facilitation by IAF Certified Professional Facilitators.